You are here: Home / Health / Care for the Loving Heart! Like humans, dogs too suffer from heart diseases. The common cardiac problems are abnormality of heart beats appropriately known as Arrhythmia and other one is cardiomyopathy (a disease of cardiac muscles). Both conditions may lead to heart failure. Here’s more on heart diseases in dogs. Cardiomyopathy (CM) is the most common cause of heart failure. It is of two types i.e. dilated cardiomyopathy (DCM) and hypertrophic cardiomyopathy (HCM). The former one is more common in dogs and later one in cats. DCM is a specific condition characterised by dilated heart chambers with a thin heart muscle and decreased contractility of the heart muscle resulting into decreased ability of the heart to pump blood throughout the body. Other one is hypertrophic cardiomyopathy wherein the walls of the chambers of the heart get thickened leading to a decrease in pumping efficiency. Doberman Pinscher, Labrador Retriever, Deerhounds, Boxers, Irish Wolfhounds and Golden Retrievers are some of the breeds who suffer commonly from cardiomyopathy. Cocker Spaniels and other smaller breeds may also suffer from cardiomyopathy less commonly. Cardiomyopathy has also been observed in German Shepherd, Great Dane and Rottweiler. Signs of distress come suddenly and the disease is generally seen in dogs of 4-10 years of age. However, cardiomyopathy has also been seen in young ones with distemper. Incidence of cardiomyopathy is greater in Doberman Pincher, Great Dane and Rottweiler. While in Boxers, heart enlargement is minimum but arrhythmias are more serious. The heart of all mammals is made up of four chambers. The upper left and right chambers are called the atria (atrium) and the lower left and right chambers are called the ventricles. Blood flows from the veins of the body into the right atrium. It is stored there briefly as it is pumped on into the right ventricle. The right ventricle pumps blood into the lungs, where it receives oxygen. It then flows from the lungs into the left atrium where it is held briefly before going on to the left ventricle. The left ventricle contains the largest muscle of the heart so it can pump blood out through the arteries to all parts of the body. What happens when heart fails? Cardiomyopathy leads to a decrease in pumping efficiency. Development of congestive heart failure is quite common in dilated cardiomyopathy. As the failing heart enlarges, the left side loses its ability to contract forcefully to pump blood through the blood vessels. When this occurs, blood begins to pool in the right side of the heart, which supplies blood to the lungs for oxygenation and receives spent blood from the thorax and abdomen. Sometimes the damage is more apparent on the right side of the heart first, sometimes on the left. But, eventually, both sides are affected because one relies on the other. The dog’s heart works hard to compensate for these changes but eventually pet can no longer perform the activities as he has been doing in the past. This stage of the disease is called congestive heart failure. In congestive heart failure, the heart is no longer able to provide blood with adequate oxygen to supply the body. Without adequate oxygen, the body’s cells become desperate and trigger a series of responses. Various hormones are released by several organs in an attempt to correct the problem. These hormones conserve and retain fluids in an effort to increase blood volume and the output of blood. For several months, these compensatory responses help the situation. However, increased fluid retention eventually becomes harmful. More and more fluid leaks out of the capillaries, causing increased gagging and coughing, and reduced stamina. Fluid in the lungs causes pulmonary edema, fluid below the skin leads to peripheral or limb edema, and fluid in the abdomen results into ascites. Peripheral or limb edema is much less common in dogs. Although cause of cardiomyopathy in dogs is generally unknown, deficiency of myocardial carnitine concentration in some dogs with cardiomyopathy has been observed and supplementation of L-carnitine in these dogs has improved their clinical condition. Dogs may suffer from dilated cardiomyopathy as a sequel of parvo myocarditis or distemper myocarditis in unvaccinated dogs. Other causes of myopathy include ischaemia, hypoxia, atherosclerotic intramural coronary artery infarction, toxins, and drugs like doxorubicin, immune mediated diseases, ehrlichiosis, or babesiosis. Hypothyroidism (deficiency of thyroid hormone) has also been associated with the development of cardiomyopathy in dogs. Early signs may include fainting, exercise intolerance, weight loss or lethargy. Many dogs remain asymptomatic, and may suddenly have symptoms associated with congestive heart failure. Signs associated with heart failure include respiratory distress (left heart failure), or abdominal distention –ascites (fluid build-up associated with right heart failure). The onset of symptoms may be extremely rapid. It is not uncommon for dogs to have a history of a few days illness. Dogs in the later stages of congestive heart failure become much less active and tire easily. Their appetite reduces and they show signs of difficult respiration, panting and coughing even while at rest. Their tummy enlarges and assumes pear-shape owing to fluid accumulates in the liver and abdomen. The colour of the membrane of the mouth may turn grayish rather than healthy pink and blood vessels on the surface are abnormally congested with blood. These dogs often show pulsation in the jugular vein. Murmurs and/or arrhythmia are heard on chest auscultation. By the time cardiomyopathy and congestive heart failure is diagnosed, dogs rarely live beyond a year. The disease is known to run in families so families with this problem should not be bred. Doberman Pinchers develop abnormal electrocardiograms up to four years before they develop clinical signs of heart failure. Many of these dogs die suddenly without warning. Pet parents often think these dogs have been poisoned. Others develop the cough and fluid retention characteristic irregular heart beat. Dilated cardiomyopathy or congestive heart failure develops over many months or even years. As heart function declines, the body is able to compensate for several weeks or months. However, at some point, the body’s ability to compensate is no longer effective. At this point, dogs go into severe heart failure in what appears to be a matter of hours. Rapid, heavy breathing, blue tongue, excessive drooling, or collapse may be the first signs that anything is wrong. Heart failure is often suspected simply on physical examination. Heart sounds in this condition tend to be muffled and the raspy noise of air passing through fluid-filled lungs is often audible. To confirm suspicions, chest X-rays is advised to review the shape of the heart. Distinctive globular shape heart in X-rays is indicative of cardiomyopathy. The normal, chiseled cardiac silhouette is replaced by a much larger, rounded heart shadow. Early in the disease the left side of the heart may be more enlarged than the right but with time both the left and right sides of the heart enlarge. In Boxers, rhythm irregularities (arrhythmias) may be detected even before X-rays show abnormal findings. The lungs of dogs with heart failure show more radio-opacity due to fluid accumulation. Electrocardiogram (EKG) is another diagnostic tool to detect early heart abnormalities before X-ray diagnosis. 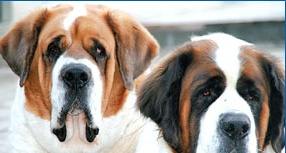 A fast, out-of-control fibrillation of the atrium is present in most of the dogs of giant breed with cardiomyopathy. In other cases left ventricle enlargement is denoted by broad QRS complex and increased R wave voltage. While, some cases have faster rate with premature contractions of the ventricles. Visualisation of the heart with an echocardiography also gives a good indication of the efficiency of the heart in pumping blood. It measures accurately the size of heart chambers as well as an indication of the degree of heart enlargement. Blood serum chemistry and urine chemistry tests are of not much utility except assisting to visualise the status of kidney and liver. Recently cardiac troponins are being used to detect cardiomyopathy in dogs. What is the future of dogs with cardiomyopathy? Unfortunately, pets with cardiomyopathy do not live long. Medication can prolong the lives of the pets for a while and can improve the quality of the life. Big breeds with the severe form may only live a few weeks from the time the problem is noticed. A few dogs have survived for about 18-20 months with continuous therapy and monitoring under specialist care. Treatment of cardiac problems should only be undertaken under the advice of a veterinary medical specialist. http://www.dogsandpupsmagazine.com/wp-content/uploads/2013/03/028.jpg 134 250 Dogs and pups Magazine http://www.dogsandpupsmagazine.com/wp-content/uploads/2017/05/1254nal.jpg Dogs and pups Magazine2013-03-24 13:50:242017-04-11 23:50:12Care for the Loving Heart!